Gamirasu Cave Hotel is the name of an exquisitely restored 30 rooms troglodyte cave house opened in 1999, in Ayvali Village near Urgup in the heart of Cappadocia, Turkey.The hotel is located in a restored thousand-year-old Byzantine monastic retreat which offers modern conveniences without distracting from the spiritual feeling of the area which has been known to be inhabited for more than five thousand years. 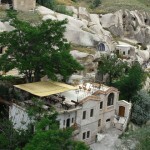 Gamirasu cave Hotel is featured in major international travel guides as one of the best cave hotels of Cappadocia. 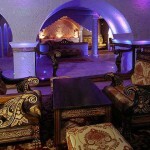 It is also mentioned as a romantic escape for honeymoons in wedding magazines. 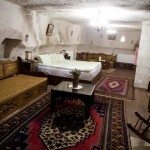 Gamirasu Cave hotel is a combination of seven old houses with 30 rooms, exquisitely restored and combined. Part of the hotel was used by Christian monks until recently. Some of the rooms were actually monk cells. The quality of the cave rooms makes you feel cool in the summer and warm in the winter.Volcanic rock called “tufa” is perfect insulation material which keeps the temperature between 17 – 20 degrees Celsius throughout the year. 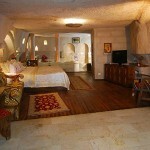 All rooms are different from each other in their size, shape and qualities. 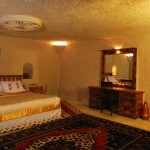 The hotel has a total of 30 rooms: Standard Double, Deluxe Rooms, Cave Suites, Family Suites and Superior Suites. 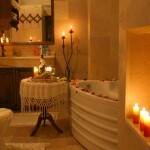 Shower and WC in the room, deluxe rooms with bath-tub, suites with Jacuzzi and fire place. telephone, hair dryer, central heating. 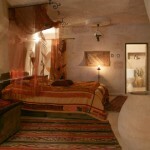 Naturally air conditionned cave rooms.